I dig the photo. I didn't dig the salad as much as the photo. To be fair, I did not execute this recipe as written by Dorie Greenspan. It was sort of close. Ok, not really. I made a lot of substitutions based on what I had in the house. I used red wine vinegar and olive oil in the dressing instead of champagne vinegar and walnut oil. I used romaine lettuce instead of mesclun or baby greens. And lastly, I used croutons instead of toasted hazelnuts (not because I wanted to, but because I burned the hazelnuts beyond recognition in the oven). 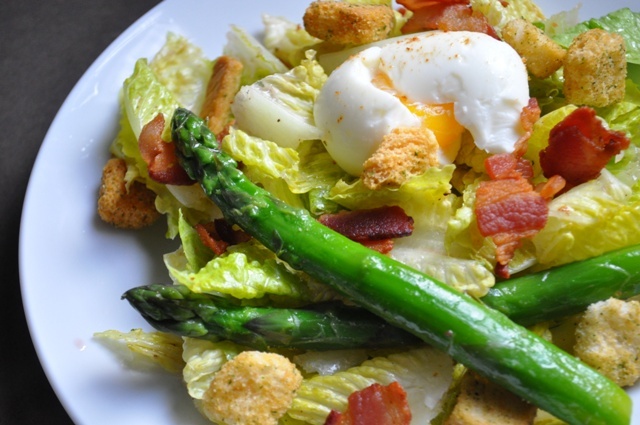 But the star ingredients in this salad were prepared (mostly) as directed....the bacon, egg and asparagus. 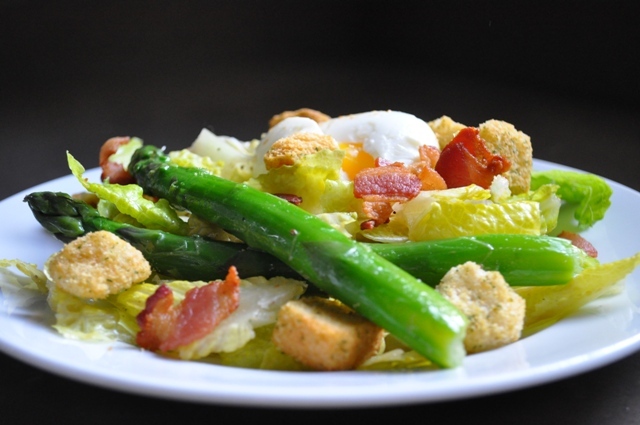 The asparagus is a bright and refreshing addition to the salad and the bacon....is just delicious. The thing I was most on fence about was the egg....I love me a nice fried egg every once in a while where the runny rich yolk spills out over the plate to be sopped up with bites of bacon and toast. The egg in this salad was only mildly runny, but I wasn't really digging it on my salad. Honestly, I should have known better. My husband is keen to remind that when we visited Paris several years ago, I got the brilliant idea I would order a pizza with a sunnyside egg on top. Not good and I ended up feeling sick (which I blamed on the jet lag, insisting the egg was fine). With 2 egg dinner mishaps, I think I'll limit my runny egg intake strictly to breakfast. Overall the salad was just fine, but I'm pretty sure my substitutions robbed this salad of it's true potential. I'm curious to see how the other French Fridays with Dorie guys and gals liked this recipe. Head over the FFwD website to see their results. Even though this recipe wasn't a home run for me, I can say I have had great success with a number of recipes from Dorie's cookbook, Around My French Table, and think this is a cookbook everyone should have in their arsenal. AH - I am right with you on the runny egg thing. It is meant for toast - not top of food. The picture is really pretty! Okay, I won't say I love the runny egg part because I know I don't, but the rest of it looks great!! My favorite thing about salads besides eating them is that the combination of things going into them seems endless. These all look like very fine adaptations to me. I heart the photo, too. We enjoyed this salad a lot, but I have to admit I hard-boiled the eggs. Your salad is pretty! I made a lot of the same substitutions as you, but I blame my not being a fan of this one on the asparagus (which I don't like) and the runny egg on a salad thing.